Story: Remember slogging the night before "journal" submission day to get a passing grade in undergrad? I remember writing (copying) journals in beautiful handwriting with extra margins drawn on the sides etc etc.. just so I get a good grade. Once a Prof. was correcting such a journal and he kept praising my handwriting and presentation. Then he moved on to the readings from the lab experiment and said - something doesn't make sense here.. we never finished the experiment because the machine was broken. He turned to me and asked - "How come you have the readings?" ... ooops. My point is - looks can be deceiving!! when it comes to cooking - you'll agree that the taste of food is more important than the presentation, the table setting etc etc. While the water for cooking pasta comes to a boil, remove the tops and the seeds from the red peppers as shown in the picture. Rub the insides of the red peppers with salt and pepper. Drizzle olive oil on the surface. Now roast the red peppers on direct flame - one at a time so that they get a nice black char. You will be able to smell the roasted pepper.. I just love the smell. Make sure not to overheat the peppers since they have to retain the shape. Pasta should be done by now - make sure it is al dente. Drain the pasta water - keep about half a cup aside for later use. Toss the pasta with the basil pesto. Use the pesto liberally so that the taste comes through even with the red pepper. Add the pasta water as needed to get a uniform coating of the pesto. Stuff each roasted pepper with the pesto penne, garnish with 1 tbsp mozzarella and a pinch of Italian seasoning. 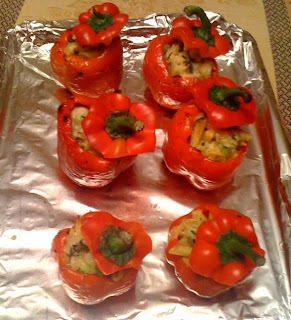 Just before serving, broil the peppers without the tops till the cheese is melted. You can use an oven, or a toaster oven.